IMCS Compression Couplings are designed to join pipe and tubing for pneumatic conveying systems. Easy to install, couplings are available in pipe and tube sizes 1/2" through 48". Couplings are available in aluminum, stainless steel, carbon steel and galvanized steel construction. Gasket material options include black and white neoprene and silicone. All couplings are equipped with a static conductive grounding strip. Call for pricing if stainless steel, carbon steel or galvanized steel is needed. 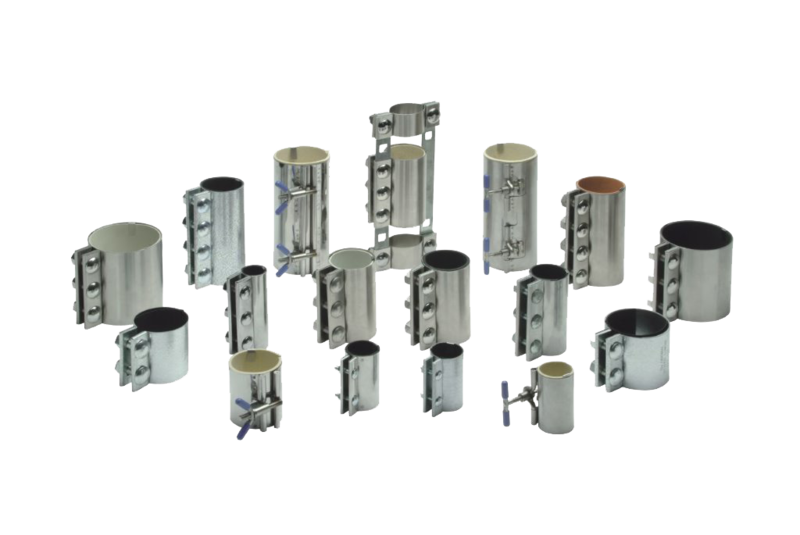 The tubing and pipe Compression Coupling is designed for permanent installation in the joining of either plain end, threaded, grooved or a combination of any of these joints. The band type construction holds the entire surface of the joint in uniform compression. Couplings are made of heavy-gauge zinc-plated steel. Gaskets furnished standard in red rubber or black neoprene. Gaskets also available in white neoprene and a variety of other materials at a slight extra charge.